Daily Pilot writer Joe Serna's article on December 4, 2008, "Fight still on against activist", HERE, picked open the scab on the whole Benito Acosta affair, allowing it to fester once again. I think that's OK - perhaps a little air and light will help this wound heal. Serna tells us that city prosecutors (read that, "Jones & Mayer") still think they have a "glimmer of hope" to prosecute Benito Acosta for his transgressions before the City Council 35 months ago. You will recall that Judge Kelly MacEachern dismissed the city's charges against Acosta because lawyer Dan Peelman, (of Jones & Mayer) hadn't been sworn as a prosecutor. Her ruling was upheld repeatedly by the Orange County appellate court. Jones & Mayer has been flogging this dead horse on their own dime ever since Judge MacEachern bounced the case, trying to wipe the egg off their corporate face. They've been acting like a legal pit bull with Acosta in it's teeth, shaking him like a rag doll. 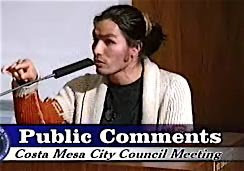 The truly astounding part of this whole thing is that none of this would have happened if then-and-current Mayor Allan Mansoor had simply administered the rules of conduct at the speaker's podium fairly and without bias. He didn't, Acosta protested and was subsequently dragged from the council chambers and arrested like a guy who had cried "Fire!" in a crowded theater. At the City Council meeting last Tuesday Jones & Mayer presented a new ordinance to the council for it's consideration. The preamble of this ordinance reads as follows: "A Resolution of the City Council of the City of Costa Mesa, California clarifying its intent with respect to legal services provided by contract city attorney Jones & Mayer". It goes on to describe in detail the delegation of authority conferred upon contract City Attorney, Kimberly Hall Barlow. The council passed the ordinance unanimously. Clearly, this is a much-too-late response to the situation we're in with the Acosta affair. It looks to me as though they are trying to close the barn door after the horse has already escaped. This is like a little kid, caught with his hand in the cookie jar, saying, "I didn't do it, but if I did, it wasn't my fault!" Is this new ordinance not a de facto admission of their failure to provide clear guidelines for the delegation of authority by Barlow to her subordinates? It sure seems like it to me. And how will any future court considering the Acosta case view this move? Won't they find it just a little bit curious? I sure do. As an observer, admittedly not close to the inner workings of the Costa Mesa Legal Department, I've been generally impressed with what appeared to be quality representation provided by Jones & Mayer since they were selected to provide legal services for our city. However, this gaffe, and their dogged, almost irrational, tenacity on this issue in which they seem to step from one pile of manure to another, leaves me wondering about the judgment at the top in that organization. I also wonder about the judgment of those in charge in our city for permitting this fiasco to continue. And, the other shoe waiting to drop is the civil action filed by the ACLU on behalf of Acosta against the city in this matter. In these difficult fiscal times, I find myself wondering how much cash the city has set aside toward a settlement of that case. In my opinion, the tax payers of this city deserve an explanation from our leaders about why they are letting this issue continue. It appears the only reason for permitting this to go forward is so Jones & Mayer can extricate themselves from the quicksand into which they've jumped with both feet.